According to the history of the present Memorial Library of Radnor Township, as compiled after much careful research by its present librarian, Mrs. Marie Good Hunt, the small reading room and lending library established in Wayne Hall on East Lancaster and Pembroke avenues served its purpose from 1882 to 1889. During this time Miss Anne S. Matlack and Miss Anna G. Markley gave their services as librarians. In 1889 new library quarters were established in a second floor room at what was then 105 North Wayne avenue. This was over the “Wayne Estate” offices of the A.J. Drexel Company of Philadelphia, a name still familiar in the annals of Wayne as promoters and builders or the “Wayne Estate Houses” scattered throughout Wayne and St. Davids. In recounting this move, Mrs. Hunt states that “at the time of acquiring the new quarters, a charter was formed, thereby setting up the library under by-laws, the name being the Radnor Library Association. The Board of Directors completely governed the running of the library – the assistant librarian only distributed books. Occasionally she exercised the privilege of extending the use of the library to some deserving person in place of a member who did not take advantage of his membership. The support of the library continued to be by subscription, supplemented by donations and charges for entertainments given by members. The use of the library increased to such proportions that the services of a paid assistant became necessary. With the influx of newcomers to Wayne in the 1880’s and 1890’s demands on the Radnor Library Association outgrew its facilities. It was then that Mrs. William Henry Sayen instigated the movement that was to result in the library’s first real home of its own. 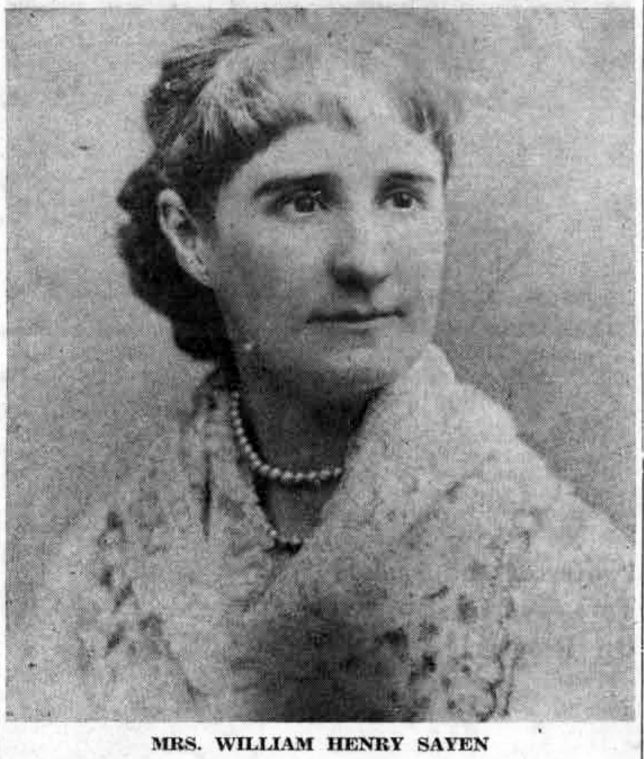 Mrs. Sayen was one of the farsighted women of her time whose interest in her community had already manifested itself in the founding of the Saturday Club in 1886. Her name, like those of Miss Markley and Miss Matlack, appears on the oldest records or that 70-year-old institution. Through the efforts of Mrs. Sayen, support for the library project in Wayne came from George W. Childs, one of Philadelphia’s foremost philanthropists of his time. His affiliations with Wayne were close, through his financial interest in the Wayne Estate building operation. His was the gift to the Library Association of ground described on an old deed as being “on the south side of Lancaster avenue and about 230 feet west of Wayne avenue in the town of Wayne, County of Delaware and State of Pennsylvania.” It was on this ground that the Radnor Library Association built its own first home. The library’s name was changed at that time to the “George W. Childs Memorial. Library.” This building, situated just to the west of the Central Baptist Church, forms the nucleus of the present large and attractive Memorial Library. The “Uniform Contract” for the building, a document preserved in the records of the library, shows that the building cost $2,900, which seems an unbelievably small sum 60 years later. Dall and Peterson of Philadelphia were the architects, while John D. Lengel of Wayne was the contractor. Another name still as familiar in Wayne as that of the contractor is that of R.H. Johnson Co., one of the subcontractors. The contract was signed for the library by Kate L. Sayen. The cost of the building was met in part by subscription from various interested donors, with a mortgage placed on the remaining balance. The final payment on this mortgage was made by William Henry Sayen in memory of his wife, Katharine Longstreth Sayen who died in 1903, since it was her interest that had made this first library building in Radnor township possible. Last week’s brief resume, in this column, of the founding of the Memorial Library of Radnor Township, took the story back to 1882. In that year two enterprising women, Miss Anna Markley and Miss Anna Matlack, started a small, free, lending library in the quaint old building on East Lancaster avenue, then known as Wayne Hall. 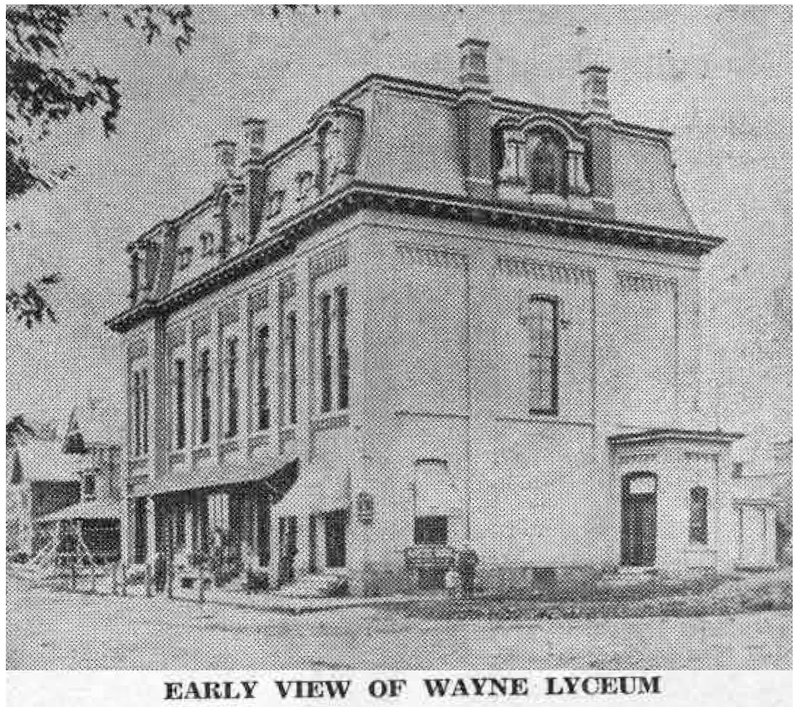 More than ten years previously a group called the Wayne Library and Literary Association had held meetings in the Lyceum building, in quarters especially provided for it, when that building was erected in 1870-71. Considerable research on the part of this columnist in the past leads her to the conclusion that its work was part of the general Lyceum program rather than that of a public library offering such facilities. Her summary of those old records continues, “the first meeting of the now organized Radnor Library Company was held February 2, 1809, at the Radnor School House. The building was situated on the grounds, with the Meeting House, on Conestoga road at Ithan. The list ot 17 selected books to be purchased show that the organization comprised a group of serious readers, as the material was either of biographical or of historical interest. The meetings continued to be held at the Radnor School House from 1809 to 1857, with the exception of 1811-1813, when Widow Elliott’s Tavern was used, and again in 1855-56 when the organization met at the houses of John Evans and John Mather.” Mrs. Hunt’s interesting record continues: “It is noted that the librarian, although elected to his office, was merely the caretaker of the 500 books which constituted the library. Mrs. Hunt’s research shows that there are now no records of a library between 1858 and and 1870. Later records do tell, however, of “an association called the Wayne Library and Literary Association which met every Tuesday at 7:30 o’clock at the Wayne Lyceum Hall,” references to which have previously been made in this column. In 1871, the year in which the Lyceum was dedicated, officers of the association were Charles A. Dillon, M.W. Rossiter, George W. Murray, William Siter and L.T. Brooke. Acting as librarian were Nettie M. Marsh and Seba Bittle. But since an entirely different group of names appeared in the records of 1872, Mrs. Hunt concludes that office was held for only one year. At that time R.H. McCormick, Dr. G.P. Sargant, William Lawrence and Emma Childs were elected to the Board of Managers and James Lynch was librarian. For the years between 1872 and 1882, Mrs. Hunt has found no records to date. As already noted it was in this latter year that Miss Matlack and Miss Markley started the small lending library in old Wayne Hall, which expanded year by year without interruption, and finally became the Memorial Library of Radnor Township we know today, with its 6,000 members and a book circulation of over 100,000 for the year past. The beautiful and spacious building which houses the Memorial Library of Radnor Township today is a far cry indeed from Wayne Hall, the small, quaint building pictured at right, yet it was in this building, then located on the northeast corner of Lancaster pike and Pembroke avenue, that the library was founded in Wayne, in 1882. 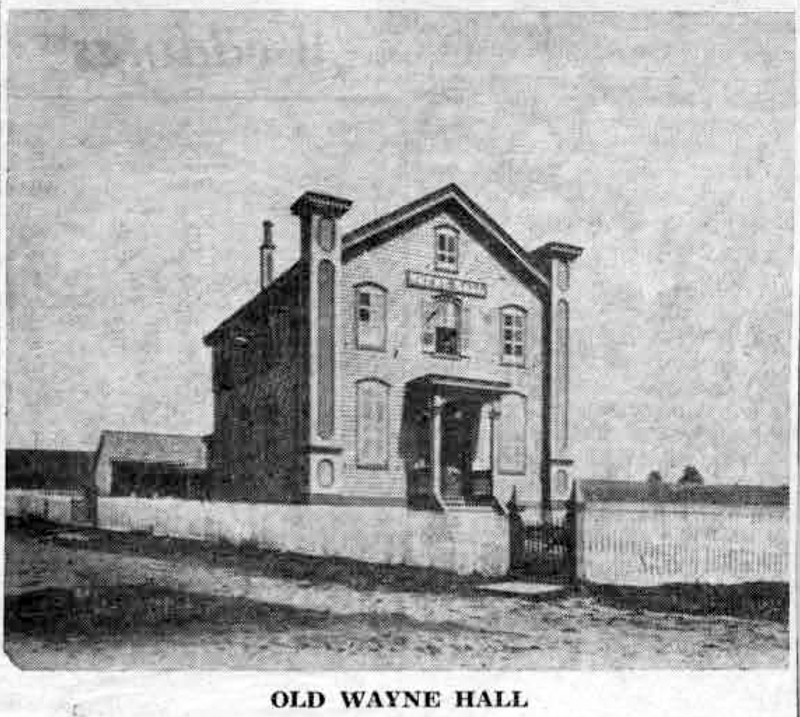 As early as 1871, a group called the Wayne Library and Literary Association met in Wayne Lyceum Hall. The latter building was erected in 1870-71, on ground donated by J. Henry Askin, sometimes called “the founder of Wayne,” which forms the nucleus of the present Colonial Building. The Wayne library, which used Wayne Hall, was provided by two farsighted women of the era of the early 80’s, Miss Anna Markley and Miss Anna Matlack. According to tradition, this library, sometimes called “the community’s pioneer enterprise,” started with two books, the Bible and a volume of Shakespeare! Only a few years later, in March, 1886, Miss Matlack and Miss Markley were to be instrumental in starting still another “pioneer enterprise” in Wayne, the Saturday Club, second oldest woman’s departmental club in the state of Pennsylvania. made by Mr. William Henry Sayen in memory of his wife, who died in 1903. One of the pioneers in library work in the community, Mrs. Sayen was also one of the early presidents of the Board of Directors.